Color is everywhere and although nature just lets whatever exist wherever, you have to be a bit more careful when you’re designing. 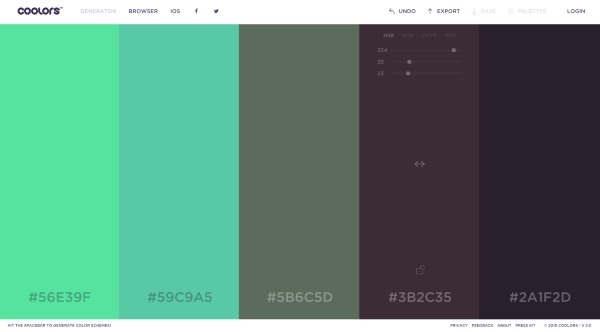 Coolors is a website that helps you pick the perfect group of colors. Enter the generator and you’re ready to go. Each time you hit the space bar, you get a new group of five colors. If you like one or two shades, but not the whole set, you can click on the lock icon and it will save that color to build around. When you are satisfied, you can either save the palette or download it in a variety of file types for use in another program. You don’t have to sign up for the site to use it but if you do, you will be able to save your palettes for later viewing. So if you get one that you like but can’t use for your project, you can just save it for later. Without a login, the site still allows you to use it. 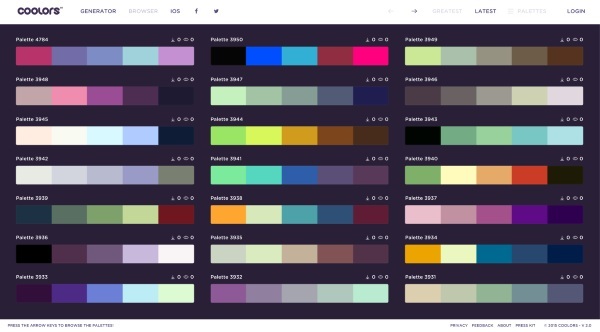 It sets you up with a random group of colors as you enter the generator and you go from there. Coolors is free but there are paid add-ons for Photoshop and Illustrator.